After winning their heroic battle against relegation last season, our local Premier League team, Southampton, are getting ready to try to reclaim their place in the PL Top Ten. Several World Cup stars play, or have played, for Southampton, including Maya Yoshida, Dejan Lovren, Jose Fonte and exciting new arrival Jan Vestergaard. In addition, legends of world football past and present such as galactico Gareth Bale, Alan Shearer, Kevin Keegan, Andrei Kanchelskis, Antti Niemi and Michael Svensson have all proudly worn the Saints’ colours. Now under Chinese ownership, Southampton FC is also the home of one of the founders of Brazilian football. Charles William Milller, a Saints player, departed from here for Brazil with a football under his arm in 1894 and the rest is history. If tickets are available, why not combine intensive language training with high-intensity, Premier League football and see global soccer stars in action at one of the true homes of world football? 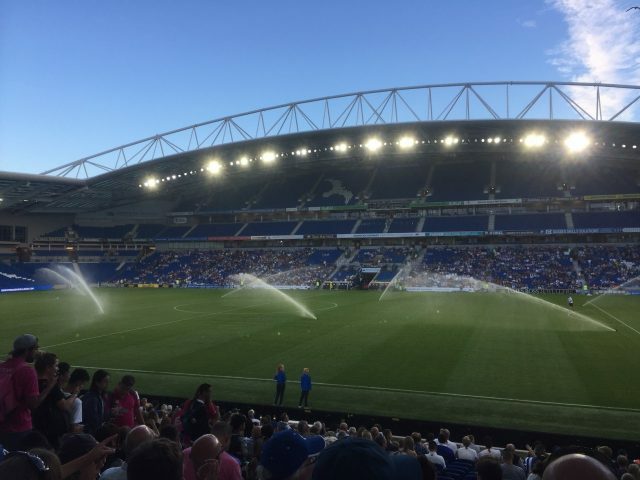 Alternatively, Brighton and Hove Albion’s majestic Amex Stadium, home of another team full of international stars, is just a couple of hours along the coast in the other direction. In addition, Southampton St. Mary’s Stadium Tours are often possible instead. All arrangements are subject to availability but we can always access the major sports channels on the flat-screen TV in the lounge of Riversdown House, giving you the big match atmosphere and the comforts of home. Global stars, world football and a truly cross-cultural sport – all right on Riversdown’s doorstep. Come and enjoy the beautiful game with us!